Here's another dinner we now make at home saving big bucks. We've cooked chicken wings in many different ways, including garlic, Teriyaki, and our favorite barbecue sauces. Here's our latest favorite. Have to give credit to hubby for this one, he just takes it to the next level... and they are SOOOO GOOD!!! Place marinade and chicken wings in sealed container, toss to coat wings evenly, place in fridge overnight. Remove wings from container when ready to cook. Place on broiler pan or baking sheet with rack. Bake at 350 degrees for about 25 minutes or until almost done. Remove wings from oven and deep fry in hot oil (350) for 2 minutes or until crispy. 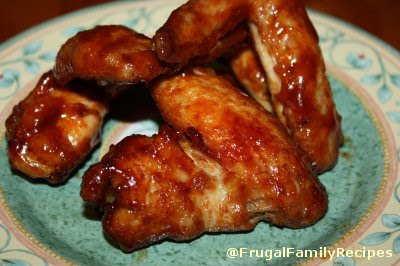 Drain wings on paper towels, sprinkle with Kosher salt, then place in large bowl and toss with favorite sauce. Serve wings with dressing on the side. Note: This marinade is so good, you can even skip the extra sauce. However, the wings are really wonderful with both!